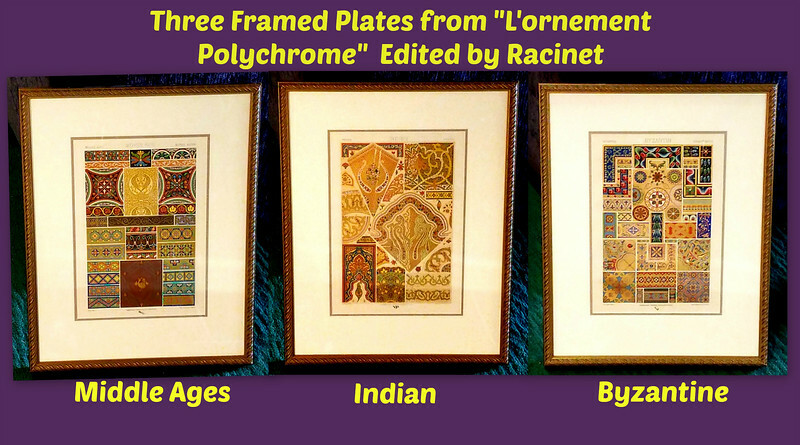 Three Framed Plates from "L'ornement Polychrome" Edited by Racinet. Excellent condition. Three mounted and giltwood framed chromolithograph plates from L'Ornement Polychrome: Motifs de tous les styles, art ancien et asiatique, Moyen Age, Renaissance, XVIIe et XVIIIe siècles, by A. Racinet, 1869-1873. Published by Firmin-Didot, Paris. Specifically, the three framed plates are Middle Ages, Renaissance and 17th century. This reference work “created to render major services to our industrial arts” brings the archeological art and polychromy of the past to the architects, artists and decorators of his time. It was published in two volumes; the first 100 plates were published in ten installments between 1869 and 1873, shortly after published as a volume in 5000 copies, a second edition was printed in 1875. The second volume containing 120 plates was published between 1885 and 1887. 16 1/4 x 21.